Jamie Phelps, local independent health insurance agent with JP Insurance Services, came to Cortez Web Services with some very specific needs. She wanted to be able to offer quotes to potential clients as well as link to external carriers with those quotes. Plus, she wanted an easy to manage blog to connect with her current and prospective clients to help drive traffic to her site. Cortez Web Services was up to the challenge. 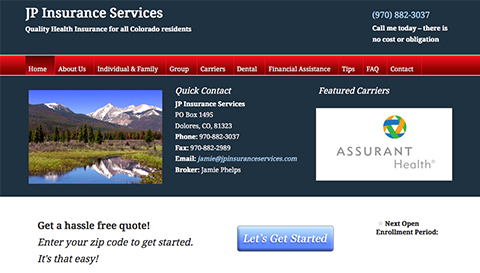 Take a look at JP Insurance Services beautiful and modern website. With lots of information, Jamie’s visitors can browse health insurance carriers, shop for insurance companies, and compare quotes side-by-side from the comfort of their computer screens.